"I am now slow to anger because I have been conditioned," Francis Hallowell says. 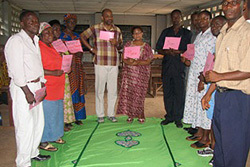 United Methodists from the United States and Liberia led a July workshop to help leaders of this West African nation train teachers to rehabilitate the minds and hearts of young people. "Rehabilitating buildings and leaving the human mind, which was actually the architect of our destruction, is dangerous," said Mariatu Kamara during the opening of the July 17-27 "Trauma Counseling and Healing Workshop." She described the mending of people as the "real bedrock of rehabilitation and reconstruction of the country." The need for such a workshop became evident last February, when students from a United Methodist high school in Yonibana burned down a local police station. After living with daily violence for 11 years, the youth used violent means to oppose the police detention of one of their student leaders. "This is a very, very helpful training because ... we still have the effects of the Feb. 9 students' riot," Kamara said. "We still have problems in how to handle them, so this training is going to help me to be able to counsel a lot of them." She said many of her students returned to school “without proper rehabilitation of the mind." Bishop Joseph C. Humper speaks at the opening ceremony for the Trauma Counseling and Healing Workshop. 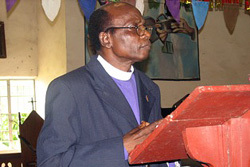 Bishop Joseph C. Humper, who leads the denomination's Sierra Leone Area, told leaders from United Methodist schools in the region that since the war ended in 2002, the government has been busy rehabilitating and reconstructing hospitals, schools and police stations that were destroyed during the years of fighting. He said it is now time to help people traumatized by the war. "If anything good ever happened to the Sierra Leone Annual (regional) Conference after the war ... it is our partners coming to say, ?We have something to offer to Sierra Leone through the training of trainers at a Trauma Counseling and Healing Workshop,'" the bishop said. The 10-day training session focused on "Soul Restoration and Deliverance." The opportunity to teach skills in trauma counseling and healing was funded by Operation Classroom, a project of the North Indiana Annual Conference in partnership with the Liberia and Sierra Leone conferences. Guy Hayes, a U.S. leader of the West Africa Trauma Team, said he was happy for the progress in Sierra Leone. "I was here in 2003, just after the treaty was signed. There were many UN troops around the country, and I was nervous. But this time we know that the troops are gone." He said other nations are now going to bring money and development opportunities to Sierra Leone. "Those things are very exciting to me," he said. 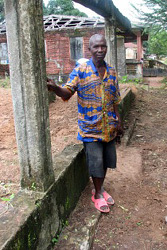 Jusu is director of communications for the United Methodist Church’s Sierra Leone Annual Conference. At the end of the 10-day training session, Hays said participants not only acquired skills to help others work through their traumatic experiences, participants also "had the opportunity to work on their own traumas." It’s difficult for people to help others when they haven’t worked through their own traumas, he explained. Kamara said the workshop helped her deal with some of her own traumatic experiences. She especially appreciated the practical suggestions offered by workshop leaders. "There were a lot of gaps in my counseling skills," she said. "I have been able to pick up a few hints and tips and skills from the training." Other Operation Classroom training leaders included Sue Mullendore, and Magnus Jusu of the United States, and the Rev. David Gbanah and Jennifer Dioh of Liberia. Francis Hallowell, a Yonibana resident, exemplifies the value of participating in such a healing experience. While sifting through the remains of his father’s burned house, he was asked how he felt about the rebels who destroyed the home. "I have no alternative but to forgive and forget," Hallowell said. "I attended a trauma counseling and healing workshop once. I know its impact. Now I can live with former ex-combatants because of the workshop I attended. I am now slow to anger because I have been conditioned." *Jusu is a journalist and United Methodist Church communicator in Freetown, Sierra Leone.